To say I was excited for this show is an understatement. I love In Flames. 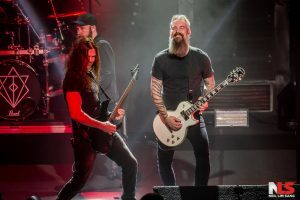 In Flames is a band that seems to walk alongside me, providing the soundtrack of my life. They supply the vehicle that allows me to show others how I’m feeling or what I’m going through (and their music just plain rules!) It’s the perfect combination of the feeling Bjorn communicates with the guitar blended with Anders’ melody and lyrics. It’s been a pleasure to grow with them as a fan. 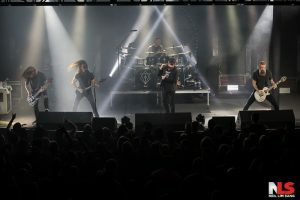 I was granted the interview with In Flames but I didn’t know if it would be Bjorn or And ers; I was thrilled with either and prepared for both. I stood next to the gate where the buses were and watched Anders walk past me. That’s when I knew it would be Bjorn. Being a longtime fan, I knew a lot about him and his band…probably more than I should. I was walked into the belly of the Roseland Theater with the tour manager as he escorted me to the green room. I was thrilled to see Seattle photographer and friend Neil there hanging out with Bjorn. The room was very small and we did a little dance trying to decide where to sit. The space was full of drinks, gear, personal belongings, and a small black love seat and coffee table. With a warm invitation from Bjorn to join him on the love seat, I hopped around and over the drums and quickly set up my recorders. Recorders…plural. I wasn’t chancing anything happening to this interview. My left leg was touching Bjorn’s right leg due to the snugness, and I silently prayed to the universe that he not feel my leg shaking. I’d met him before in 2000, but it had been a long time with significant t life experience during those 19 years, and…I’m always a little nervous when I interview, especially when I’m a big fan of the interviewee’s music. I always write detailed notes for interviews and rest them on my lap in the event I have a glitch in my brain. That happened to me once when I was interviewing Ola from Grave. His piercing blue eyes dazzled me to the point I totally forgot how to talk, and when I pulled myself out from his gaze, I absolutely had no idea where I was in the interview. Luckily, he was a good sport and I recovered. I wasn’t going to let that happening here. I was very prepared for Bjorn and had incredibly clarity (OK, that was a not so clever reference to “Come Clarity”). I decided to ditch my notes and just go organic. Bjorn is soft spoken, open, passionate, and very laid back and chill. I always strive for the artist I interview to say one of two things: “That was the best interview ever,” or “No one has ever asked me that question before.” I got the latter from Bjorn. I left the interview with a handshake and some light conversation, and quickly ran around the venue to get in line. I knew exactly where I wanted to sit in the balcony and wasn’t willing to take the chance of anyone else getting there first. Smash Into Pieces was the opening band. I didn’t know anything about them and was prepared to be moderately entertained (just because I was so excited for In Flames.) To my surprise, they were really good. It’s so hard in today’s mass conglomeration of bands to do something new, be it in sound or in gimmick. The drummer came out with the most amazing LED face mask and started a beat. His backdrop mimicked his mask in both color and pattern for the majority of the show and he was quickly joined by the rest of the band. From Sweden, this modern rock band provided excellent entertainment as we waited for In Flames (and it never hurts when fit Swedish men play shirtless). In Flames took the stage timely and Anders quickly let us kno w he was a bit under the weather. Had he not said anything, you’d never have known. 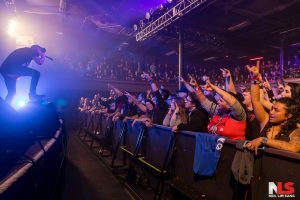 Touring on their newest album, “I, The Mask,” In Flames showed us, once again, why they remain relevant. I know the division that sometimes occurs between In Flames fans regarding the direction of their music. 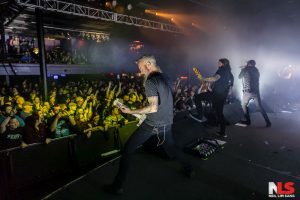 It has to be a tough road to grow as an artist, balance what the fans expect, and not repeat yourself or use a “formula.” In Flames constantly grow and that is reflected in their music, and for that I’m glad. They played mostly songs from “Sounds of a Playground Fading” forward. Band members come and go, and we often don’t like it. 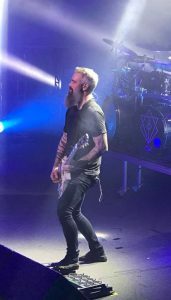 In Flames has managed to endure change and evolve rather than crumble. Thank you Anders and Bjorn for keeping this beloved band going. Bjorn told me earlier that they had about 48 hours of notice that Niclas Engelin would not be able to accompany them on this tour. He said they considered cancelling, but quickly decided that wasn’t an option. They heard Chris Broderick (formerly of Megadeth) was available and jumped at the chance. With a new drummer, bassist, and guitarist, Anders and Bjorn pulled off every song with very few technical errors. I was so overwhelmed after seeing In Flames and had an early meeting, so I decided the responsible thing to do was to go home early. I soon heard from everyone that missing Within Temptation was a huge mistake. I will catch them next time.